Fonteee is a free app available for Android Phones. You can easily convert your words into typography and it's very easy to use. According to Fonteee, "It is the best tool to automatically turn your words, saying or quotes into beautiful photo text designs. It's the coolest typography tool. With one click, you can create amazing text layouts with cool fonts and stunning layout design. 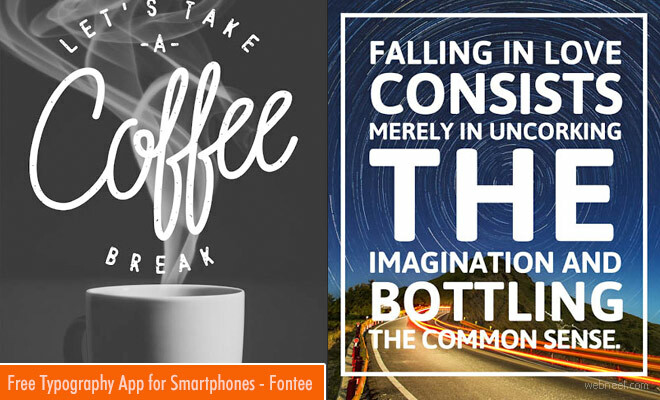 Fonteee is more than a tool to create text on photo, or write memes on pictures. It also contains various photo editing features. 10000+ free stickers and 1000+ quotes stickers will make your photo stand out. 200+ photo filter preset pack, free to download. 1000+ fonts, free to download". You can easily create typography by choosing one of your photos or choose a background, you can edit text, choose your favorite quote. You can also choose a typography template and play around with different styles. Once you have created your typography, you save it and share on social media sites. ✔ Make your own quotes, 10+ templates and 10000+ different styles of EACH template. ✔ Add stylish quotes to elegant photos. Make beautiful graphics for social network. ✔ Caption your words and memories. ✔ Create flyer and share.